handle brake fluid with care: the fluid reacts chemically with paint, plastic, rubber materials, etc. if air is trapped in the master cylinder, bleed air from the master cylinder first in the same manner as follows. 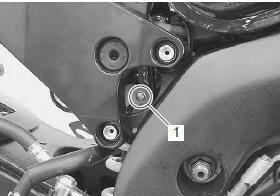 Refer to “front brake master cylinder assembly removal and installation” . Remove the reservoir cap and diaphragm. Fill the reservoir with brake fluid to the upper line of the reservoir. Place the reservoir cap to prevent dirt from entering. Attach a hose to the air bleeder valve, and insert the free end of the hose into a receptacle. Squeeze and release the brake lever several times in rapid succession and squeeze the lever fully without releasing it. 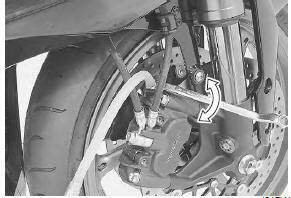 Loosen the air bleeder valve by turning it a quarter of a turn so that the brake fluid runs into the receptacle, this will remove the tension of the brake lever causing it to touch the handlebar grip. Close the air bleeder valve, pump and squeeze the lever, and open the valve. Repeat this process until the fluid flowing into the receptacle no longer contains air bubbles. while bleeding the brake system, replenish the brake fluid in the reservoir as necessary. Make sure that there is always some fluid visible in the reservoir. Close the air bleeder valve and disconnect the hose. 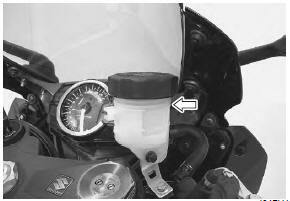 Fill the reservoir with brake fluid to the upper line of the reservoir. Install the diaphragm and reservoir cap. the difference of bleeding operation from the front brake is that the rear master cylinder is actuated by a pedal.